Just like tomatoes have a season, so does grass fed beef. Lush summer grass makes for great tasting beef. Winter grass makes for less flavorful—and less tender—beef. At Carman Ranch in Oregon, the cattle spend their whole lives eating local, native grasses, out on pasture as much as the seasons allow. While the ranch isn't certified organic they follow organic practices, including not using any pesticides, fertilizers, growth-promoting antibiotics, or hormones. They only produce beef when the grass is at its richest and the cattle are at their fattest, making for seriously flavorful beef. 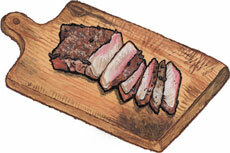 These bonless strip steaks have deeply savory, with earthy flavor and a great mineral tang. Ships frozen. "Women are leading the trend of sustainable ranching and raising grass-fed breeds of cattle in humane, ecological ways.... Cory Carman thought she’d spend just a summer working on her family’s ranch in Wallowa, Ore., but she has parlayed her parents’ prairie into a leading local provider of grass-fed beef."